Experience the detailed scenes and life-changing words and parables of Jesus as revealed to the Italian Catholic mystic Maria Valtorta. This app is fantastic! It is very professional, has a great design, works seamlessly, has every feature I could imagine to enhance the reading of this great mystic's writings, and is very convenient to use on a regular basis. This app takes immersing yourself in the world of Jesus as seen by this mystic to a whole new level of accessibility and convenience since it is available wherever you go! Thanks so much for making this App available. This is a very nourishing reading material for those who seek God and His words. WONDERFUL APP! Thank you SO much! I love getting to Mass early and reflecting on the readings. I just can't thank you enough for your ministry with this app. It truly brings the Mass to life for me each week! Thank you again! Amazing Gift! God bless you richly! Thank you very much! Amazing gift! Maria's writings have helped me immensely to understand the true teachings of Jesus, and to get to know better Him, His Holy Mother, St. Joseph, and all of the disciples and other people from the Bible. I am so happy to have this app that connects the Mass readings with her revelations! Thank you! "THE App" for our troubled times, and our troubled hearts. The full book takes you on location wherever Jesus is. You travel with Him and His disciples, hear Him converse with the crowds. His teachings here are the most comprehensive. You will enjoy reading, most of 'getting to know Jesus', as He really was. Read the book before passing any judgement. After reading the book, the reader does not need to travel to the Holy Land. Jesus has already shown us the Lands. I Thank "My Lord My God" Who is teaching me to repeat the words of Wisdom revealed to Elizabeth: You are blessed amongst all women! Blessed is the Fruit of Your womb..! How did I deserve that the Mother of my Lord should come to me, Your servant? My soul rejoices on reading the Words of Love of Trinity God........I thank the servants of God who watered this App ....Let us make Jesus Mary known to the world.... we poor sinners need Them most.... Ave Maria! Thanks for your work for making this app. I can picture the place described because I've been there!!! I just discovered this app and found it very useful. It saves me a lot of time to go through her books to find related topics of daily reading of the Holy Scriptures. Highly recommend to anyone who is interested in deepening their faith. 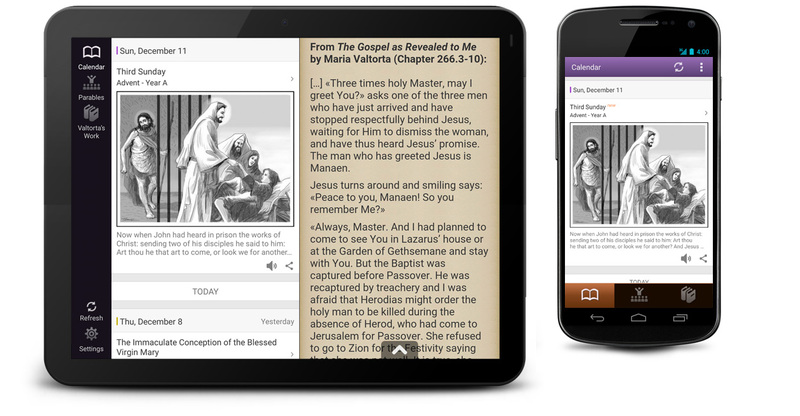 Every Sunday and major feast day, this app will display the readings from the canonized Gospels for that Sunday followed by the passage from The Gospel as Revealed to Me that corresponds to that Gospel reading. Audio recordings of these readings are also available in English and Italian. 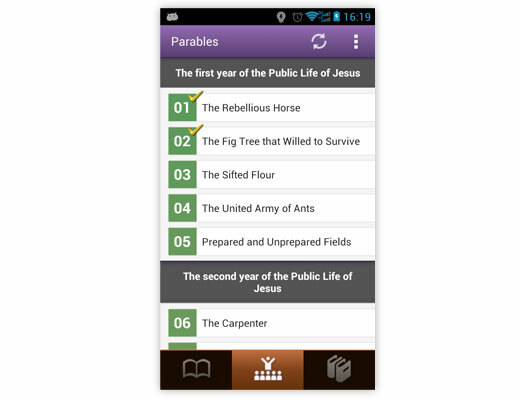 This app contains many parables of Jesus, which includes parables from The Gospel as Revealed to Me as well as from Maria Valtorta's other published works. You can mark your progress as you read through them. 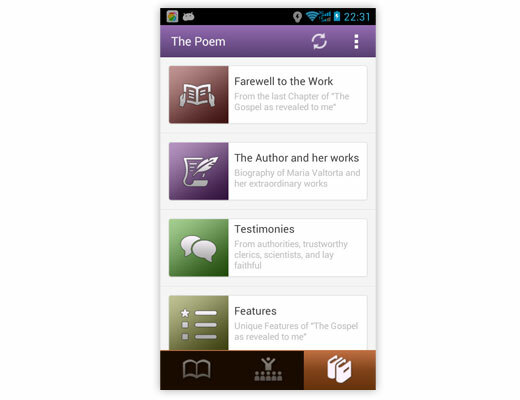 This app also contains additional excerpts and information, including the last chapter of Maria Valtorta's work which describes its purpose, a short biography of Maria Valtorta and her works, notable testimonies of Church authorities, bishops, priests, and lay faithful, as well as information on the unique features of her main work. It is recommended to read Valtorta's work The Gospel as Revealed to Me from front to back at least once before reading isolated excerpts or chapters from her writings in order to fully experience and properly understand the characters and events.